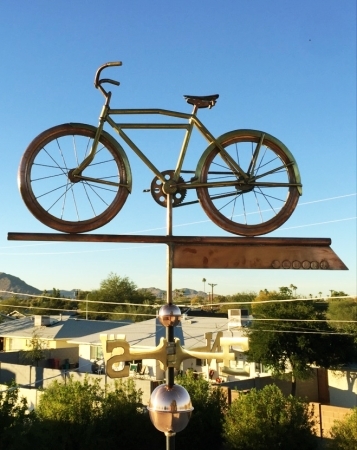 Our 1918 Schwinn Bicycle Weather Vane is an homage to a slower pace of life. 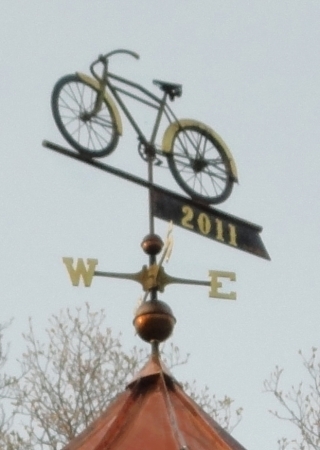 The first version of this weathervane was commissioned as a Christmas present by a dad for his son, who happened to live next door. 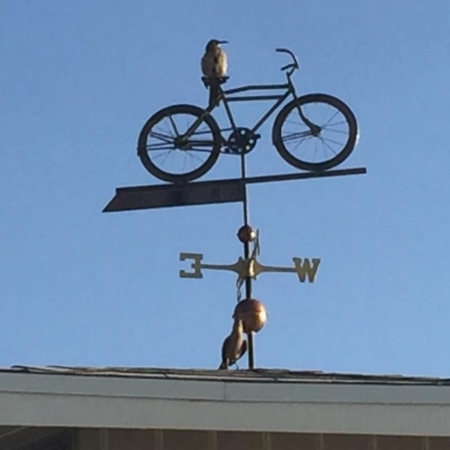 The son had spent several years sourcing the parts for and rebuilding a 1918 Schwinn Bicycle and Dad enjoyed honoring his avocation. 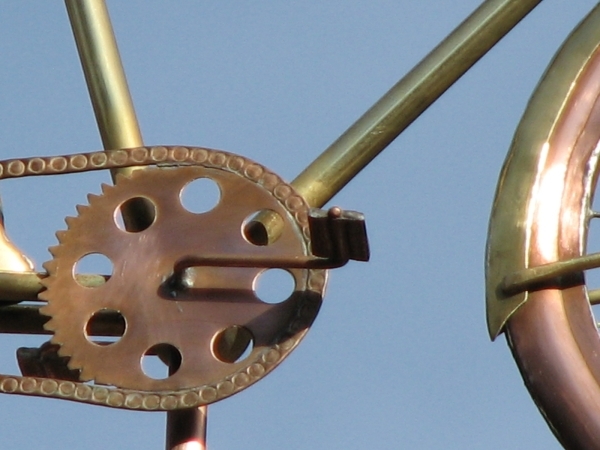 The vane shown here was a wife’s birthday present to her husband. 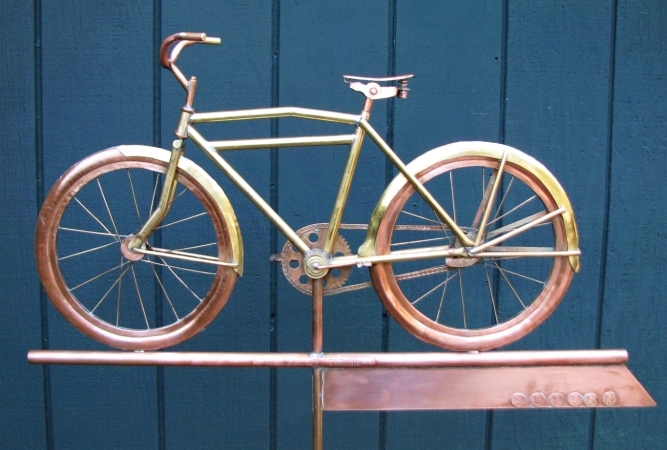 The handle bars, tires, gears and chain, fenders and seat were crafted in copper while the frame and spokes are of brass. 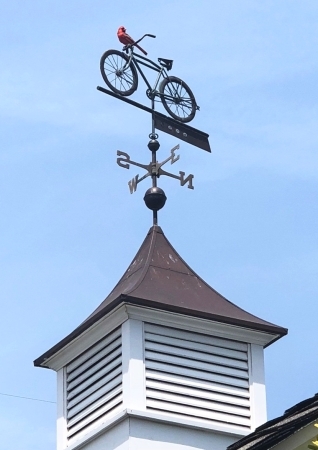 If you look closely at the half fletching below the back wheel, you can see that we included a ‘lucky’ penny from the year the recipient was born and another to celebrate his birthday and the year the weathervane was made. They loved this piece; in their words: We thank all of you again. It really gives us joy. 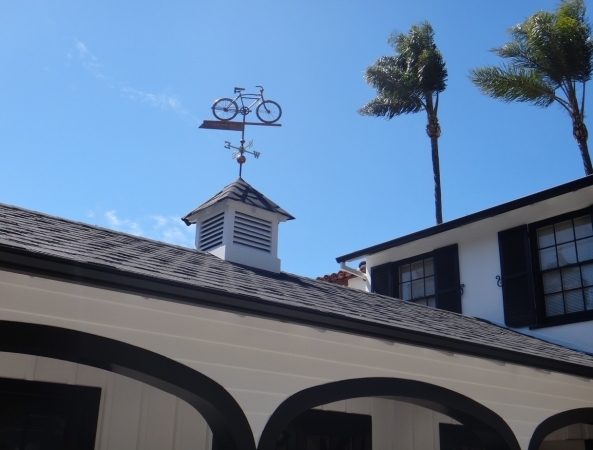 Because we make every weathervane to order, we can vary the materials used. 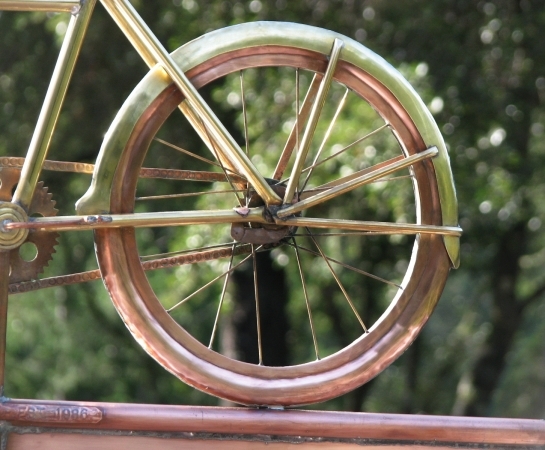 Popular choices include copper, brass, optional nickel silver, palladium and/or gold leaf. 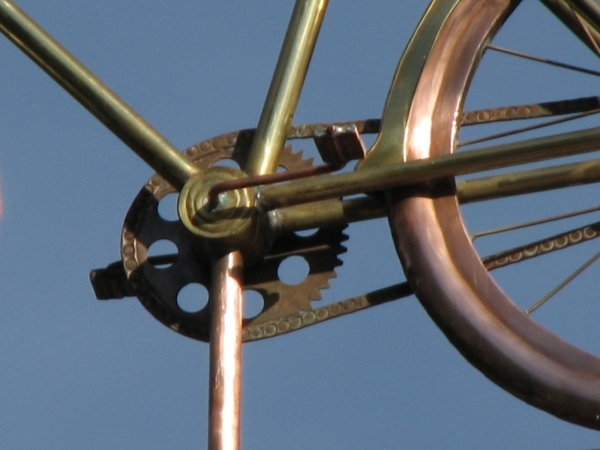 Using a combination of metals can create visual interest as the weathervane moves through the patina process. 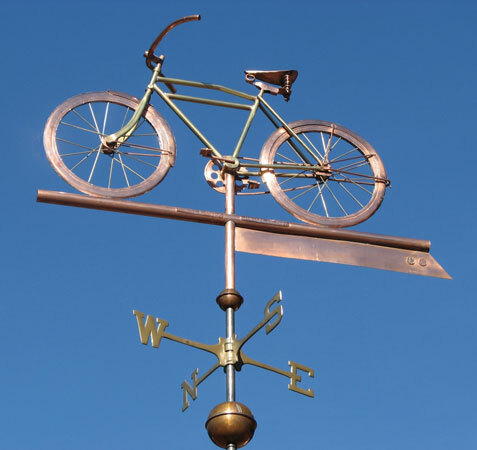 We specialize in custom copper weathervanes so if you have an idea in mind, we would be happy to work with you to bring your vision to life. 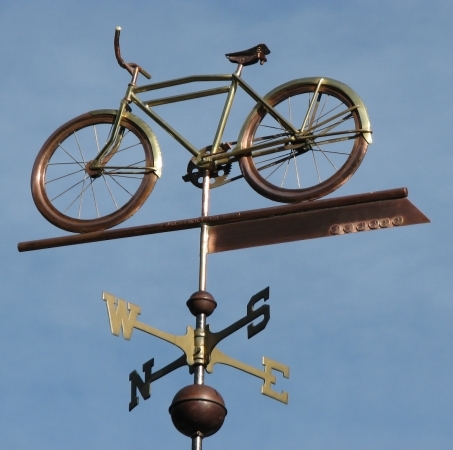 When ordering a custom bicycle weathervane, we are often able to reduce the design fee if detailed schematic drawings are available. 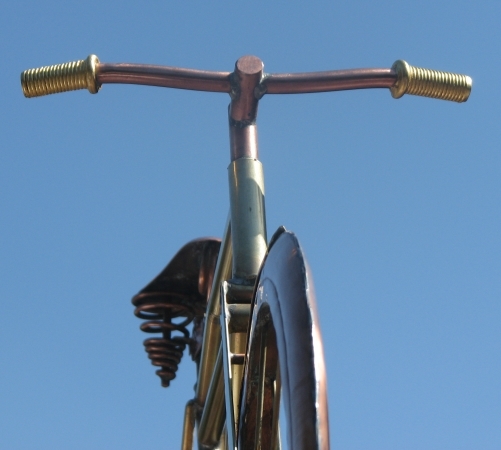 Also helpful are detailed photos of the actual bike including details and other distinguishing features. If actual scaled down models are available, we often find them helpful guides during the construction process. 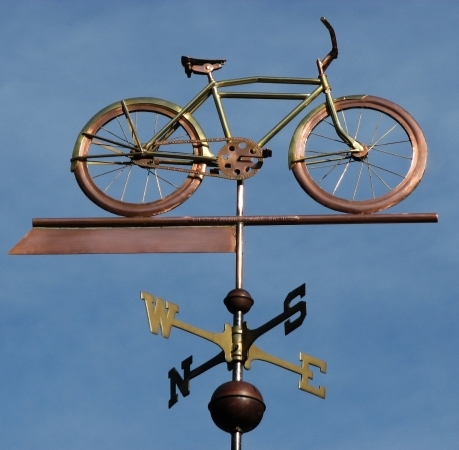 The price of our weathervanes is based on the time it takes us to make them. 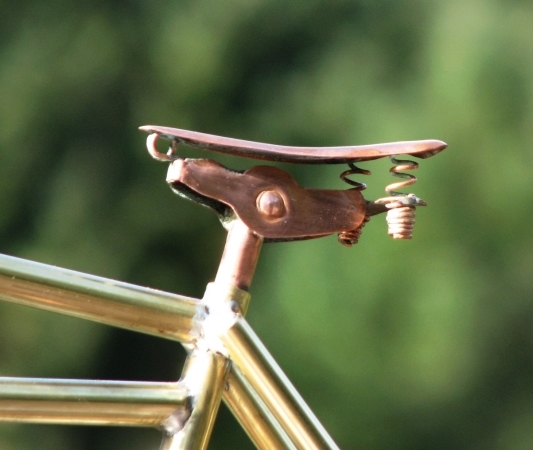 The more details we add, typically the longer it takes to craft. 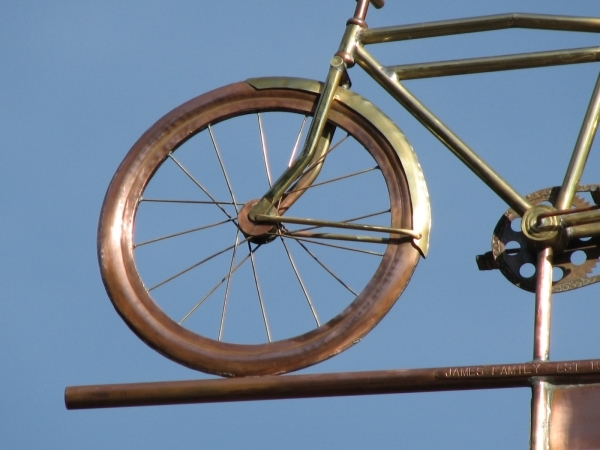 Keep in mind that skillfully made handcrafted copper weathervanes can last a very long time, even a century or more, and are quite collectible. 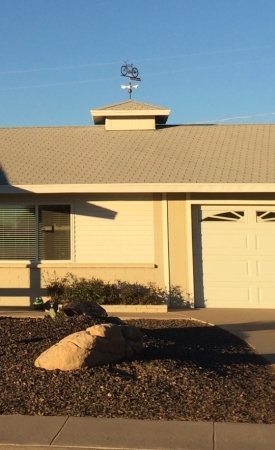 Your weather vane may not spend its entire life in its original location up on the roof or on a cupola where such details are not as easily visible. Someone in the future may want to display it indoors as a piece of American Folk Art. If this is the case, fine details would certainly be seen and valued. We will add or eliminate details based on each customer’s preference.